I love Mexican food and eat tacos at least twice a week if not more. At the low end, there is the truck taco selling for less than $2 a taco. Because of the genre as a fast food- there is a 3x price ceiling on tacos and $12 is really as much as you can charge for plate of 2 tacos in the Bay Area. At the higher end, I enjoyed two calamari tacos for $12 at Padrecito in Cole Valley where probably 75% went straight into to paying their exhorbitant SF rent. Although a taco truck might employ lesser grades of meat, even a truck taco is highly satisfying and quite tasty. 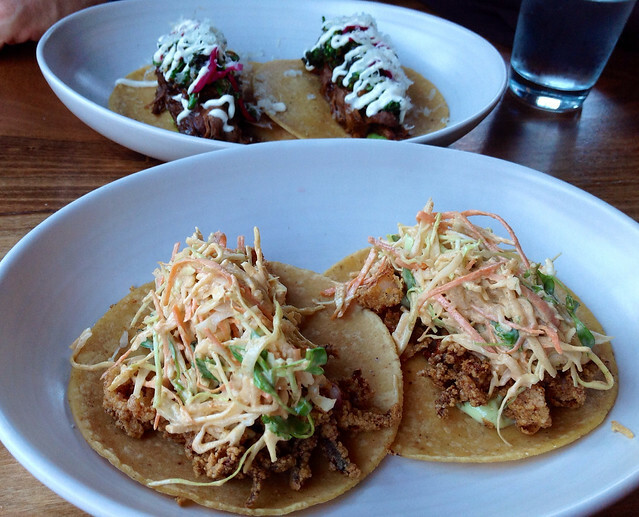 I eat out several hundred times a year from $4~$75 per head but because cheap tacos are so satisfying, it's becoming harder for me to enjoy expensive dinners. I've had many a meal this year at $40+ that was only a hair better than my usual neighborhood $3.75 taco on a hand made tortilla. In hind sight I would have done better to save those thousands of dollars for tea. This kind of cost analysis is constantly disrupting my tea sessions since my tea closet if full of cheap taco tea. Today I tried to enjoy an expensive aged Yiwu and it was good- the huigan lasted over an hour. But because it was the most expensive Yiwu I've sampled, my expectations cast a shadow over the brewing. At a certain price point, i.e. over $300 a beeng, I wrongly expect miracles in the mouth. I am not the person to drop thousands on a beeng although I might drop a hundo on the right sample. The current price of serious aged teas is such that it's an extravagant luxury in the province of rich businessmen. Really, I don't mind drinking my less than stellar genres of tea which are often times as satisfying as the best tacos. 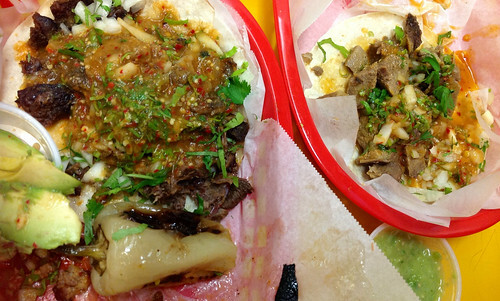 You are lucky to live in the land of tacos. Those are some pretty specimens in your photos. There is one decent bus I know of in all of Montana and it is down on the lonely steppes of Dillon. You can get a little seat inside and watch Mexican wrestling. You can grill most excellent meats so you can enjoy a home taco night if decent tortillas are to be found in the grocery stores. But it's never as easy as queueing up and be fed almost immediately arounds here. When I was growing up in the East Coast, it was all tex mex. Tacos meant ground up meat and grated yellow cheese on these hard corn shells that came in a box but still I remember eating them fondly. It is a dilemma, for sure. I've been asking myself, do I brew my less expensive teas with the same care and consideration as the pricey ones, and to what extent does that make a difference? Some cheap teas are remarkably well bred and respond well to gongfu brewing. But I first equalize everything on a gaiwan -cheap or expensive. Tacos, like croissants, are a different game than tea. They are meant to be filling a need in a different way than tea could. I have a fairly different response than hster, perhaps because I have so much good tea I can drink, that I need not worry too much about price of anything I get to try. Even though I wish I could have bought more, I am very grateful for the tea I do have. And I am grateful because really good tea can really make a bad day better, in a way that tacos, or chocolate chip cookies, or chili cannot. A complex, not easily defined, aroma and taste transports me away from my humble restrictions. The qi settles my nerves down, and the warmth sooths my body. If I had spent my money on things, they would have been used, eventually to be broken or forgotten, like that ancient Zaurus PDA that I bought for reading books...Which I soon ditched for importing the Sony Librie, which did well for three years, before the 500 and 505 eReader that I must now replace the battery, somehow. The tea? Four years bought, still gives pleasure, and I can look forward to more so long as what little prosperity I have continues. Each session was about my memories, is about my pleasure, will map my future opportunities. Standing on the streetside, eating a delicious taco just isn't like that. Cheap tea isn't like that either. You deny the powers of a delicious croissant because you are not a bakery addict. I've had many an excellent almond croissant that has righted the wrongs of a day and has transported me back decades in a Proustian reverie of most happy memories. Any foodstuffs or drink can potentially become a profound experience under the right circumstances as much of it is our brain chemistry. Not every person who drinks your teas will respond the same way and some may respond the same way to a lesser tea. Who among us doesn't remember being tea drunk on some unworthy tea early on in our drinking days. But I'm quite appreciative of your response as tea is also the drug of my choice. But I don't respond as consistently, I've stopped chasing the high highs and need just a maintenance dose. "A complex, not easily defined, aroma and taste transports me away from my humble restrictions." - Hmmm, sounds familiar. Sounds like an experience one might have while eating a good taco. Yes, but do you wonder about the qualities of that next taco, today? A year hence? Ten years hence? Here in Waukegan we have no shortage of cheap super good tacos. You can get some at the corner mexican market for $1. But the best I have to say are still with my Grandmothers homemade tortillas de arina, (handmade flour tortillas) for breakfast with papas con huevo, (potatoes with egg) with a little habanero salsa. I will also always compare the price ratio of anything, With most expensive puerh, we are paying not for the best taste or satisfaction, it is more for the name, fame, or origin of the tea now. I just had recently a 1999 yiwu worth around $500 a cake and today a 2000 cnnp green stamp worth $60, and I enjoyed both but more so the latter because I wasnt looking for something extraordinary, I just enjoyed it. You talking about the Fuhai? Your grandma's tacos made with loving care sound incomparable. My grandma Cho is sadly long gone from this earth but she made so many delicious festival foods I yearn to taste again. I think you and I can readily enjoy a humbly priced sheng. I'm kind of ambivalent about these expensive older Yiwus but I'm not that into Yiwus in the first place - too classical and restrained. Yes Shah the fuhai from EOT. And the cnnp is the one from Life in Teacup. A salsa bar is such a fabulous concept that I'm disappointed it's not a taco restaurant standard. Pepita salsa with pumpkin seed is my favorite. People like you and me want a little bit of everything!